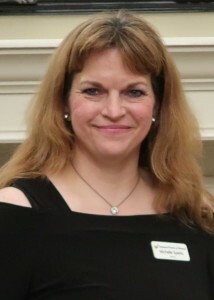 Michelle Sparks was chosen as the SBW 2018-2019 Woman of the Year. Michelle is dedicated to bettering the lives of women and children in and around our community. She has been a dedicated member of Sedalia Business Women and Business Women of Missouri since 2002. During her time as a member, Michelle served on, and chaired, numerous committees. In 2010, she joined the SBW executive committee as recording secretary. Rising up through the ranks, she became president in 2013 encouraging members to “Pay it Forward.” Ever a committed member to the values and mission of SBW and BWM, Michelle filled the role of president, again, in 2015 when she invested in membership recruitment and retention, as well as promoting the visibility of our local and state scholarships. Michelle served on the state level in 2016-2017 as the NW Regional Director-Elect and then as NW Regional Director. During that time, she served as a knowledgeable liaison between BWM and our local SBW club. Due to her diligent work on scholarships, she was asked to join the BWM Foundation in 2018, furthering her commitment to help women in our community and across the state. Beyond her commitment to SBW and BWM, Michelle is a strong woman of faith that has served as a spiritual mentor to numerous children and families in our area. She is a member of First Baptist Church where she has served in a variety of capacities: 1st grade Sunday school teacher for 13 years, numerous children’s ministries including vacation Bible school, Kids at Praise (KAPOW) as well as being a mentor for the Mothers of Preschoolers (MOPS) program. If this weren’t enough to keep her busy, she finds time to be a member of the Show-Me Sound Chorus and a clogging group in Windsor. Michelle’s success in life has been no small feat. She returned to college late in life to pursue her education while being a wife and mother. Michelle received her Bachelor of Science in Education and now serves as a Para Professional at Heber Hunt Elementary. Michelle’s character, work ethic, and generosity embody everything that is good about SBW and our community. Congratulations, Michelle, for this well-deserved honor!